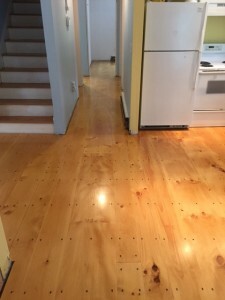 I wanted to give you an update on the installation of the pine flooring in my home in Kennebunkport, Maine. My contractor continues to rave about the high quality of the flooring. All of the lumber was perfectly straight, true to width dimension and a pleasure to install. We used all of the boards your staff marked as “free” – I actually think the knots (defects) had great character and needed to be on display.Our “waste” factor was truly minimal as a testimonial to the quality of the flooring. 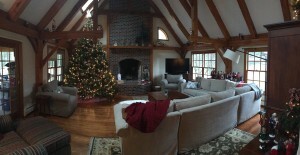 As promised, attached is a photo of our family room, all decorated for Christmas with our new pine floor. It came out even better than we expected! 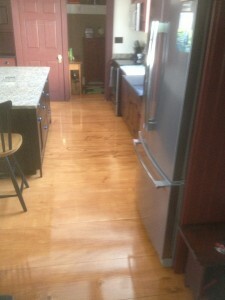 We used Zar stain Early American with 4 coats of a Satin Poly. I don’t Facebook, so here’s a couple pics of my floor. Ripped old floor to base barn boards, patched sub- subfloor, screwed securely with heavy wire screws, than installed new basic 3/4″ cdx plywood screwed with heavy wire screws. As we installed new boards, we pre drilled for plugs, 3 holes across every 16 inches, located holes to end up with plugs in line with each board. We used drill press with plug cutter bits to cut 800 plus plugs from ends of flooring boards. Wedged each board tight to adjacent board as screwed in with heavy wire screws. When originally finished some seams you couldn’t see. Installed the plugs, glued, and played a little with matching plugs to boards to run with grain and hue of the wood. Chiseled off the excess plug. Sanded with 3 head orbital sander and 6″ vibrating sander. Stained numerous times with Minwax puritan pine. 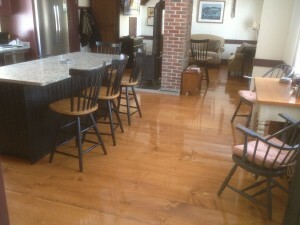 Previously had numerous test stain and poly boards to get close as possible to old pine floors in rest of house. We thought about roughing boards (some say with rusty chain), but didn’t. Pine will take its own character as its soft. It will also take on its own color as it ages. At first I looked at every ding but as long as furniture is padded on feet, aging will be great. Finally, 4 coats of polyurethane, high gloss. Turns out it will match rest of house fine. Keep in mind this is a 1875 house with a lot of original pine floors. 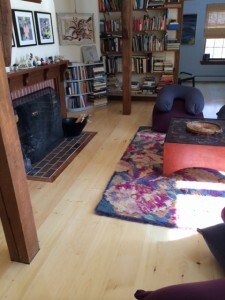 End result… a couple months later I asked my wife if she would have done floor differently. She said she loved it, so I’m all set! Our floors are GORGEOUS thanks to The Wood Mill of Maine, and Bjarki, it’s proprietor, who has been so helpful every step of the way as we took on ordering, laying, and finishing them ourselves! From the moment I put in a quote query, all my calls, concerns, needs were addressed directly, quickly, with care, precision, knowledge, and quality. The lumber was beautiful when we brought it home. Now that it is installed, I am amazed: no cupping, no twisting, no warping… no faults at all! Your wide pine flooring has impressed everyone who has seen it. Thank you deeply for accommodating such a small order as mine, and for being an honest, truthful man. My wife is a happy camper now. All our friends love our new pine floor too! 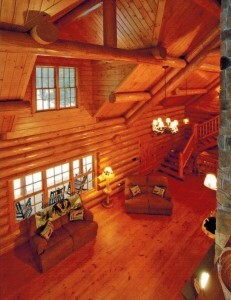 Enclosed are some pictures of the log home we just finished in Harrison, ME near Sebago lake using your 8″ -16″ wide pine. Isn’t it GORGEOUS? We took your flooring and used antique nails each and every one nailed by hand. Then we finished the pine floors with a treatment from Paul Revere’s day – developed in late 1700’s – we stained the floors with Puritan Pine from MinWax, then sealed it with a mixture made from cubed varnish, gum and tongue oil. These floors look a million dollars!!! Again a grateful thanks to your husband, yourself and the whole crew. You guys are the BEST! The floor has been laid. One coat of Ipswich Pine stain, followed by four coats of urethane. Beautiful, absolutely beautiful. Thank you so much for the best damn pine floor I’ve ever seen. And I also deeply appreciate the time you gave us with explanation and the workings of “Wood Idea.” I hope my friend Wally didn’t ask too many questions. I’m proud of you folks and what you have been able to accomplish. My hope is that I’ll have many opportunities to show the superior quality of your wood products to lots of folks down here, and that your orders will grow. The extra wood was used for final trim work. Most people can’t belive you can create 20″ wide boards. If anyone asks, I’ll give them your name. So far every one who has seen our ceiling has fallen in love with it and wants to know the story behind it. Please tell all at Wood Idea that most people say the ceiling is their favorite thing in the house. I tell people that I struck gold when I called Wood Idea. So true. Thank you for the wonderful ceiling you made for me.